The following is a guide for using our new Account View. Account View is only available to iMeet® Central for Agencies and Marketers and must be enabled for your company in order to use the feature. Please contact iMeet Central Support to discuss enabling Account View. To access your account view page, click on Accounts in the top navigation bar. Selecting Accounts will take you to the "All Accounts" view. Here you can see all of your accounts company-wide. Selecting an account will take you to the overview page for that account. Here you can view information regarding the account properties and the progress of the projects stored in the account. Using the Options menu in the top right, you can edit the account properties, change or remove the cover photo for the account, and move or delete the account. 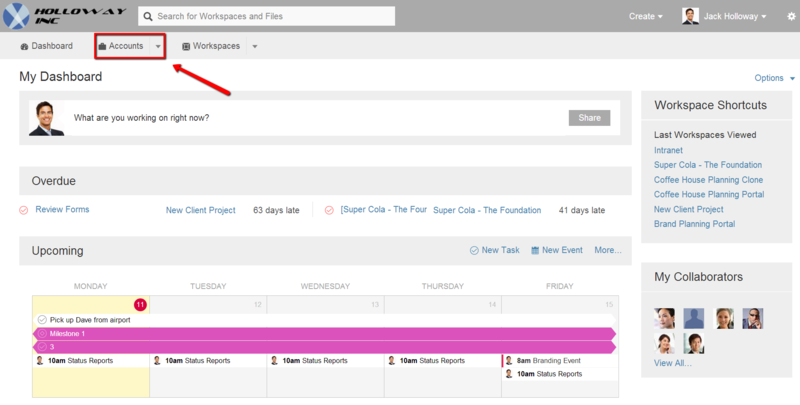 In the "Activity" section, you can see a graphical overview of any tasks and milestones due within the next two weeks for the account. Tasks are mapped by a blue line and milestones are mapped by a orange line. The lines will elevate leading up to days when tasks or milestones are due. In the example provided, there is one task due on August 12th, 13th, and 20th respectively. To see the details of a given day, hover your cursor over that day on the graph. 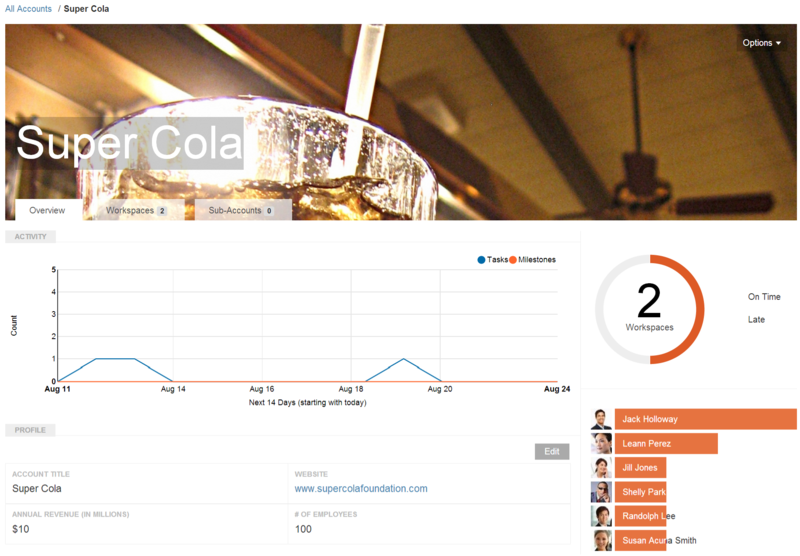 In the "Profile" section, you can view the properties of the account. Custom account fields can be created in the Company Setup section. To learn more about Custom Account Properties please view this article. 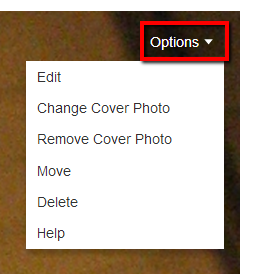 To edit the profile for an account, select the "Edit" button in the top right of the "Profile" section. In the sidebar section, you can see a graphical overview of the progress of the the workspaces stored in the account and the amount of tasks and milestones assigned to the members of those workspaces. 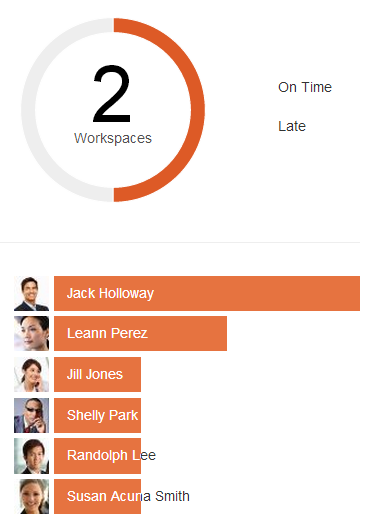 The circular workspace chart gives you a view of whether or not milestones and tasks are being completed on time in the account. The large number in the center tells you how many workspaces are in the account, and the coloring of the outside circle tells you the relative amount of milestones and tasks that are on time or late. Gray coloring is used for late activities (activities that are past their due dates and still not marked as complete) and orange coloring is used for activities that are still on time. The member ranking chart gives you a view of how many milestones and tasks your users are assigned to. More assignments means a higher ranking and a wider orange bar for a user. In the example provided, Jack Holloway is assigned to the most tasks and milestones for this account. Using the tabs at the top of the overview page, you can get views of the workspaces stored in the account and any sub-accounts created for the account.